This a truly wonderful release of essential mono recordings, let me put that out there right at the beginning. There is so much pleasure to be gained from listening to these recordings (some of which I am used to hearing in stereo for all my listening life). There are a few points about Dylan's mono recordings in general that I wish to make, however. 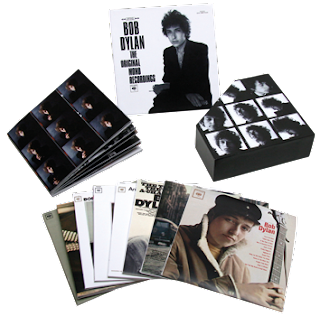 Firstly, I believe it is a bit of myth that the stereo recordings of the early albums were "guitar out of one channel and Dylan's voice out of the other", "Taxman" style, rudimentary stereo. I have all the albums in their remastered stereo versions and, with this box set in their remastered mono versions. To me, the first four all albums sound pretty much the same. There is no bass to benefit from the centralised mono punch or multi-instrumentation to sound good in stereo. These four albums sound acceptable in either format, as the stereo doesn't really kick in at all, to be honest, they just sound mono to me, anyway. Maybe this is just me, and my ears just can't detect. Either way it doesn't really matter, either version does the job for me. It is on the next four albums that some serious differences can be found, particularly on "John Wesley Harding" and "Blonde On Blonde". The latter sounds ok in stereo, but there is a bit of a "Taxman" 60s stereo feel about the masterings, in my opinion. The mono, on the other hand, is a revelation. Listen to that massive bass on "Obviously 5 Believers" punching right out centre field on your speakers. On the stereo version, the bass is barely discernible, comparatively. "Visions Of Johanna" also has a magnificent bass reproduction in mono, as does "Stuck Inside Of Mobile With The Memphis Blues Again" and "Brand New Leopard Skin Pill Box Hat". The stereo is much weaker, more lightweight. Play these mono recordings mega-loud and you will love it, like being in the studio with The Band. The percussion intro to "Sad Eyed Lady Of The Lowlands" is crystal clear and razor sharp, like a bell. The stereo version, on the other hand, has the same sound restricted to the right channel and doesn't sound anywhere near as convincing. A couple that, in my opinion, sound better in stereo are "Pledging My Time" and "You Most Likely Go Your Way And I'll Go Mine", which are just a little muffled in mono. The wonderful descending bass line on "John Wesley Harding's" "The Wicked Messenger" is huge in mono. In stereo it is almost deliberately quiet, inexplicably and unforgivably. "Highway 61 Revisited" has superb mono bass on "Tombstone Blues" and the title track. "From A Buick 6" is great too. "Desolation Row" benefits from the centralisation of the acoustic guitar, but I am yet to be convinced about "Like A Rolling Stone". "Bringing It All Back Home's" manic "Subterranean Homesick Blues" is, as one might expect, magnificent in its mono attack and power. Overall, these mono recordings are an excellent listening experience that you will not regret investing in. If you like big, powerful, booming bass making your floor shake you will love it.